Welcome to April. 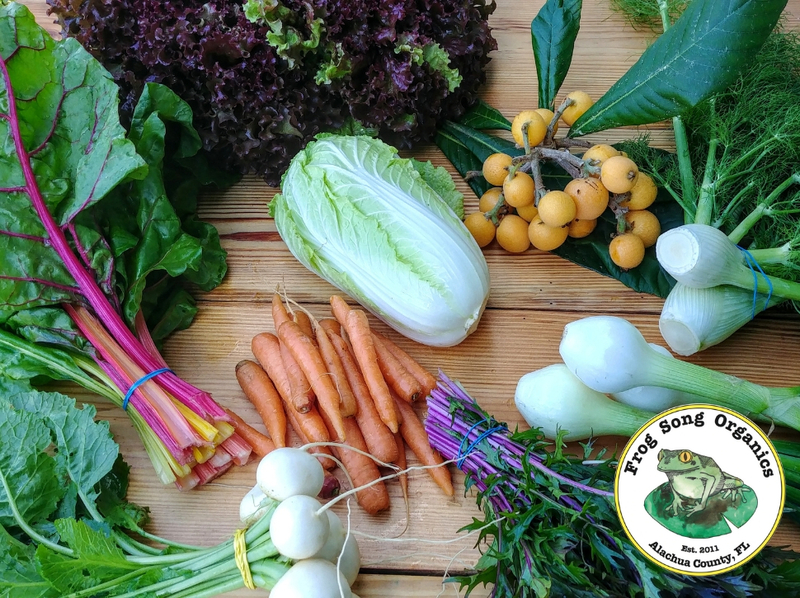 We are on our 5th week of the season and excited to bring you this colorful and bountiful harvest of: Rainbow Chard, Tokyo Turnips, Mizuna, Sweet Onions, Baby Fennel, Napa Cabbage, Sweet Baby Carrots, Red Leaf Lettuce and Loquats from our friend Jenny, down the road at High Springs Orchard. 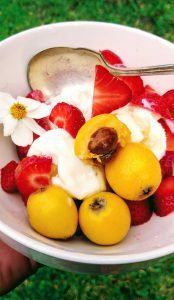 Love the Loquats? 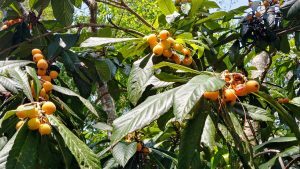 Join us this weekend, April 5,6 and 7th in High Springs- for a Loquat U-Pick: Fri, Sat and Sun from 10-5 or until they are all gone $3/lb. More info on our Facebook Page. The Loquat or “Japanese Plum” originates from China and thrives in north Florida’s temperate climate. It’s flavor is described as a mixture of peach, citrus and mild mango and is most popular used in jams, preserves and makes a deliciously sweet light wine. The orange Loquat fruits grow in clusters of 5 to 10 and are harvested in early spring. These fruits have a light edible skin (altho most recipes tell you to remove the skin, you really don’t need to) and contain two to four large smooth seeds. The seeds can be saved to make Nespolino- an Italian liqueur and the large, evergreen leaves hold medicinal benefits and can be brewed into a tea. The tree is propagated through seed and usually starts to produce fruit 8 to 10 years after planted. Save your seeds they grow very well here in full sun and well drained soils, they are also very hearty, wind and drought resistant. As rare of a fruit as these may be, they are quite common up here in the Gainesville area. I have several on my property. Like everything else, they have good years and bad years. Last year there were none. This year the trees are covered in bright orange clusters and the squirrels and birds are kind enough to share. We have so much that we are considering making some Loquat wine this weekend. I will let you know how it goes. They are simple to eat, just pop them in your mouth and spit out the seed, bake them in crumbles, or they make a great topping on ice cream. They are very similar to apricots so use them as a apricot substitute in your favorite recipe. 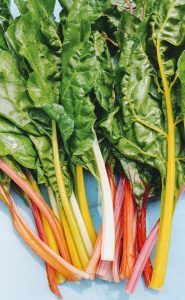 Rainbow Chard is just colorful varieties of swiss chard, which is a relative of the beet, but unlike traditional beets – which put their energy into producing colorful roots – chard instead produces big, tender leaves and colorful crunchy stalks. Chard is cooked similar to spinach, sauteing and adding to casseroles and quiches. To saute- Roughly chop the leaves and finely chop the thicker stalks; this helps the two parts cook in about the same time. Generally, any flavor that works well with spinach will partner with chard, including butter, lemon, cream, garlic, shallots and vinaigrette. If you do nothing more than briefly steam or saute the chopped chard, and toss it with any of those, you’ll have a great side dish. Unroll the pie crust and set into a pie pan, crimping and trimming as needed to form an even edge. Set aside. In a large skillet over medium-high heat, combine the bacon, onion and chard. Cook until the chard has wilted and released water, about 6 minutes. Let the bacon mixture cool slightly, then use a slotted spoon to transfer it to the crust, arranging it in an even layer. Scatter the brie evenly over it. In a large bowl, whisk together the eggs, milk, thyme, salt and pepper. Pour the egg mixture into the tart shell, then bake for 25 minutes or until puffed and set at the center and lightly browned at the edges. Purple Mizuna- Mizuna is an Asian green that is commonly found in baby lettuce mixes. This mild tasting green can be enjoyed raw or cooked. Give it a good wash and spin it dry and toss it in with the red leaf lettuce from your share for a colorful spring salad or saute it (for just a few minutes) with the rainbow chard, garlic and olive oil for a tasty, simple and vibrant side dish. Fennel has a crunchy texture and mildly sweet, licorice-like flavor, making it a pleasant addition to any dish, whether eaten raw or cooked. You can eat all parts of the fennel however the bulb is most commonly used in recipes while the fronds make beautiful garnishes and edible arrangements. Fennel will stay fresh in the refrigerator for about a week however, it loses its flavor over time. If its been in your fridge for quite some time not to worry, it makes a great soup or soup stock. Here’s just a few things you can do with your fennel. Heat butter and olive oil in a large heavy-bottomed soup pot. Add garlic, onion, celery, fennel, carrots and ginger. Saute for 10 minutes, stirring frequently. Add stock, bring to a boil, then cover and lower heat to a gentle simmer. Let simmer for 30 minutes, until all vegetables are soft and tender. Remove from the heat. Add coriander, ginger, crushed red pepper and honey. Let cool slightly. Puree soup in batches in a regular blender until very smooth. Return to pot. Add half & half, and season to taste with freshly ground black pepper and kosher salt. Serve in bowls or mugs with a garnish of chopped fennel frond. Napa Cabbage commonly known as Chinese cabbage is a sweet and crunchy cabbage with thin, tender leaves. It is popular addition to soups and stir fry’s but I favor it raw, it is so sweet and crisp. Tokyo Turnips, Hakurei or salad turnip- A sweet, small, mild tasting turnip tender enough to eat raw in salads. 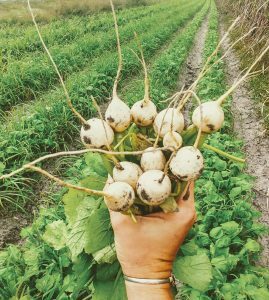 These dainty turnips are best described as a cross between a radish and a turnip. Eat them raw or give them a little heat- the buttery flavor of this turnip comes out when cooked or roasted. The dressing is a simple blend of buttermilk, apple cider vinegar, a touch of mayo, shallots, sugar, salt and pepper but the flavor is anything but.